Ever feel like you’re the only thing holding it all together? Here’s hoping that everyone else in your life recognizes that fact and has duly compensated you on this, your day. 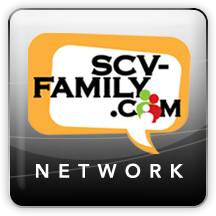 A special shout out to all the “mommies” – friends and family – in my life. YOU ROCK! Sorry MAMMAKAZES. Haven’t posted the last couple of days because I’ve had a little site issue. Seems some wacky ScriptKids (aka hackers) decided to mess with my website. No danger to my readers or anything. Just now, if you google MAMMAKAZE, in addition to legit links, you might also find yourself at a website featuring, say, Indonesian Hookers. Yep, that’s just what a desperate nursing mom looking for advice hopes to find… women serving up their bodies for the pleasure of strangers. Wait, hey. Maybe that’s not an altogether incongruous linkage. I mean, isn’t a nursing mother someone who is serving up her body for the pleasure of a stranger? Cuz don’t tell me that mewling little creature you bring home from the hospital isn’t a stranger. At least for the first few weeks days. Whatever. It’s been taken care of thanks to my website guru WILL. Thanks Will! You rock! And if I ever make money off this website, I’ll –HAHAHAHAHAHAHAHAHAHAHAHAHAHAHAHAHAHAHAHA! Sorry, I just realized what I was saying. Bottom line. It’s going to take a few days for the weird linkages to disappear. So in the meantime, be warned. If you GOOGLE or BING my website name and the URL looks weird, it probably is. So don’t go there. Well, unless you’re looking for an “innocent” excuse to “accidentally” link Mlathi and her friends in Jakarta. At Mammakaze, we don’t judge. Back tomorrow with the usual musings. And you ScriptKids. Yeah, you! Didn’t your mom teach you manners? SHEESH! Yeah, yeah. I’m not posting regularly again this week. So sue me. It’s spring break and my kid who normally requires most of my attention, is requiring ALL of my attention. And Randy the prefekt husband is off too. So we’re getting to spend some quality family time, which almost never happens since he has one of those jobs and commutes that reduces us to being ships that pass in the night. And by passing I mean, he says “hello” as he turns on the TV and I say “hey” as I roll over to go to sleep. Now, THAT’S entertainment. This week, we actually get to interact for more than a few minutes at a time. Well, if I get off the computer we will. So that’s what I’m gonna do. So I may or may not post. Depends where the week takes me. And I know some of that week includes Disneyland (it’s 2fer time for So. Cal residents! ), goofy golf and a day trip to Santa Barbara. 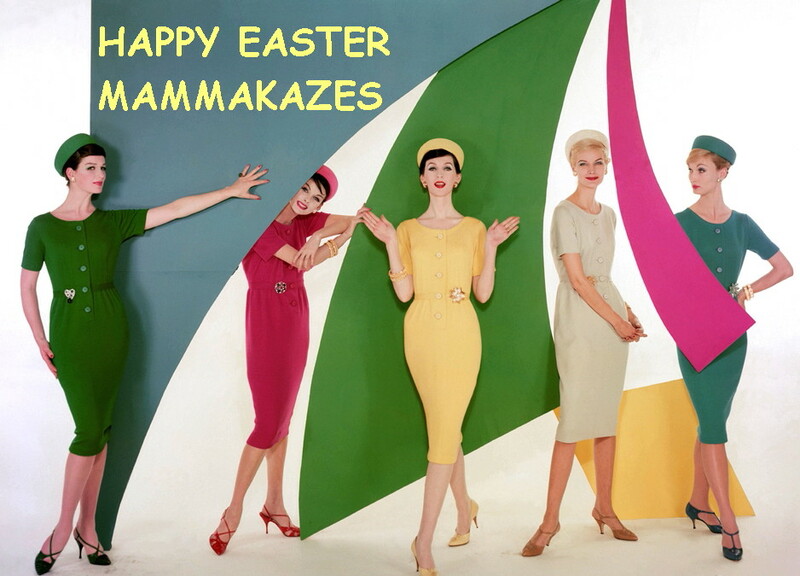 Here’s hoping all you MAMMAKAZES out there have a wonderful spring break filled with family time and (if you’re lucky and there’s a playdate involved at some other kid’s house) a little nooky too. A girl can dream, can’t she? Well, Easter is this Sunday and if you’re like me, it hit you like a ton of bricks just yesterday that you only had a couple of days to do the Easter Bunny’s bidding. That guy is such a procrastinator. And like me, perhaps you made a mad dash while your kid was in school on her last minimum day before Spring Break to Target, Kohl’s and See’s Candy. Well, there was no dashing to See’s. More like standing in line for a really, really long time with a $6.40 box of butter eggs behind the lady buying $300 worth of chocolates. Who’s mom is she? And why isn’t she mine? That freebie sample chocolate was the only thing that kept me from throwing up my hands and going to the Walgreen’s for those hollow bunnies that taste more like wax and aluminum foil than chocolate. Lucky for Julia. Anyway, her basket is done. See’s chocolate. 2 Webkinz (lest you think I’m a spoiler, they’re the Li’l Kinz) and a pair of jammies. Candies. They make the cutest, silky ones. We don’t do a lot of stuff in the baskets, Especially candy. There’s enough of it in life… very much like disappointment. I don’t even know WHY I’m doing a basket. I’m not even sure Julia still believes in the Easter Bunny. I suspect she’s faking it so she can get the goods. But hey. I’m all for holding on to the magic as long as possible even if based on a big fat lie and a lot of fakery. It keeps her little in my eyes. A little faker, but still. Anyway, hope you have a wonderful Easter or Spring Break or whatever you are celebrating during this glorious April week! Okay. It’s T minus 6 days until the SPECTACULAR SPECTACULAR known as Julia’s annual birthday party. Yes. I go all out. However, this year I may have outdone myself. Because we’re throwing a Harry Potter themed B-Day party for which I have made all manner of fantabulous things: bags of Bertie Botts Every Flavor Beans, House Flags, Emergency Dementor chocolates. I mean, I’m turning my garage into Hogwarts and I have several adults dressing up as professors! It’s totally cool. And I’ll post some of the pics this week. 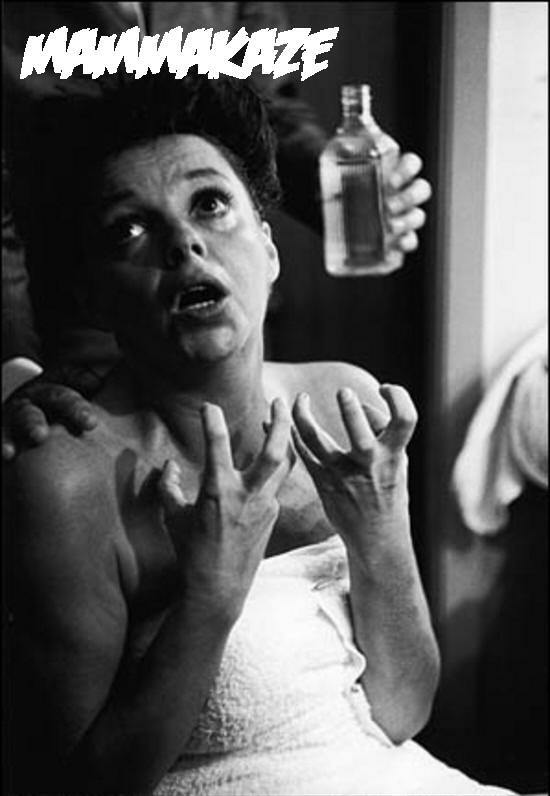 But for now, I wanted all my readers to know that if I come across a little “Judy Garland on pills and booze after finding Vincente Minelli with another dude-ish” this week, you know why. No… it doesn’t have anything to do with Randy the perfekt husband and another dude! It’s all the party prep. We’re having 27 kids! Aaaaggggghhhhh! Also my birthday is coming up too. And every birthday since my 35th has been a little unnerving. You know, the whole time marches on thing. It freaks me out and I find it more than a little unfair and I wish there was some place I could write to complain, because if I could I know I could get whoever is responsible to do away with it. Seriously. I’m talented that way. I wrote Disneyland once about a Cast Member who cursed in line at The Haunted Mansion and got a free meal at the Blue Bayou Restaurant. Anyway, come back daily and share the party prep hijinks and the disintegration of my nerves. It’ll provide MUCH amusement. I assure you! 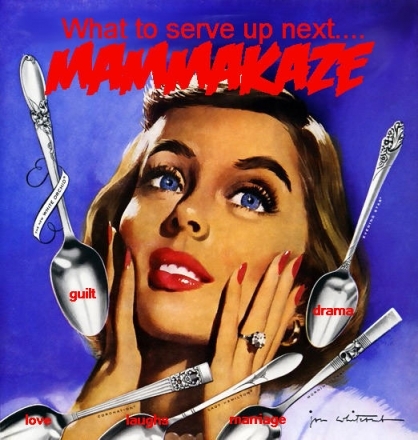 Also, spread the word about MAMMAKAZE…if you dare! I meant to do this list as 2009 came to a close. But I avoided it. I think it was because things were going so well for the first time in a long time, that I really didn’t want to relive the horrors of the past year. Well, enough time has passed and the new year has begun on a pretty good note. So I can comfortably look back now at the year that was and share with you why I’m glad IT’S FINALLY #$%&* OVER! TOP TEN REASONS 2009 SUCKED! Cracked Rims on ALL our Honda tires for which Honda would not take responsibility. Apparently we “drive over too many potholes” here in our well-paved suburbia. Kidney Stones…Randy, not me for a change. Uh. Wait, That’s only 9. Okay. Maybe 2009 was NOT as bad as I remember it. Oh. Who am I kidding? Yeah it was. Just because MORE things didn’t happen doesn’t mean that the ones that did weren’t horrible. 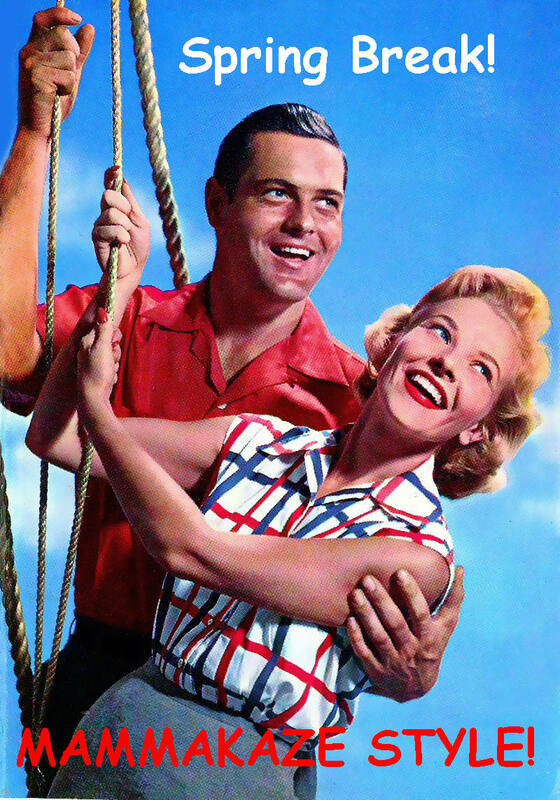 But because Randy the perfekt husband always accuses me of being a glass half empty kind of gal, I am going to attempt to look at the bright side of the year from hell. Having insurance to pay for the hundreds of thousands of dollars in medical bills we incurred, including the $80,000 in anti-venom! Taking Julia to see her WV relatives – her great-grandmother just turned 95! 11 years of marriage – woulda thunk? Buying size 6 jeans again. I thought that would NEVER happen. My brother John getting married. HE thought that would NEVER happen. Getting an iPod – OMG! How did we ever live without it? HOLY MOLY! A late addition I thought of AFTER I posted. I started MAMMAKAZE last year! Well, looks like in retrospect, the glass is more on the FULL side than the empty. That’s the great thing about retrospect. It comes with it’s own special set of glasses… usually in a rose tint. And in the end, any year that one survives…after which one is still standing, is a good year. No? And now it’s a new year. 2010. New opportunities. New possibilities. New everything. I’m feeling the excitement of it. Are you? Today is where your book begins, the rest is still unwritten. 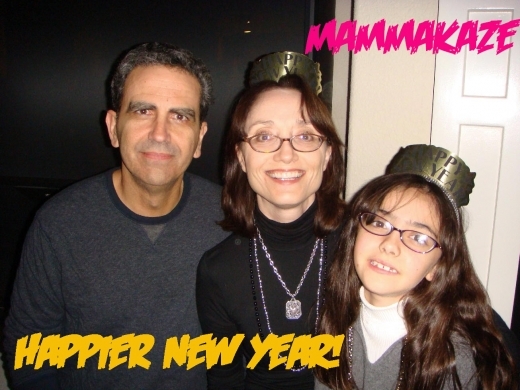 Here’s wishing all my MAMMAKAZES a wonderful 2010… without any rattlesnake bites!